Bad pitching instruction is making pitchers throw with their arms. When front foot plants ball is looking at 2nd base. This is just one of the many bad pitching cues being taught by almost everyone. This is the actual arm position of the best MLB pitchers, when their front foot plants, that are very successful and don't have arm problems. The very best pitchers do the complete opposite of almost every pitching cue that is being taught to 99% of baseball pitchers today. 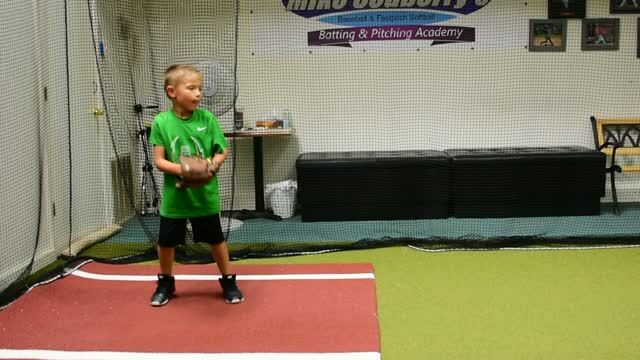 Picture on left is a 6 year old student learning to throw correctly. When he first came in he couldn't throw the ball 30 feet without a 10 foot high arc. Video on right shows by learning how to correctly throw the ball he is now able to throw the ball 44 MPH consistently. Amazing difference. arm. Above 3 pictures show the worst pitching cues being taught to 99% of pitchers. Faster arm circle, flip the wrist, hello elbow and scoop the ice cream. The best pitchers do not flip their wrist, hello elbow or faster arm circle. They do something completely different for more speed and control. My name is Michael Stanford and I am currently playing baseball at Weatherford College in Texas. In 2018 I tore my UCL and needed to get Tommy John surgery. I was mentally struggling with being behind schedule with my recovery process because I had been having elbow pain. My Father, David Stanford played baseball with Mike in High School and reached out to him to help me with my pitching mechanics. Mike didn't hesitate to fly out to Texas and spend three days to help me with my mechanics to help prevent my elbow pain and potentially another surgery in the future. After I threw a bullpen for him he identified right off the bat the problem with my mechanics and the reason for my arm pain. I was balancing, throwing over the top, pulling down, etc. all the things I had been taught. He then showed me what I needed to do to get on the right track to improve velocity and reduce arm issues. After only three days of working with Mike I was able to change my mechanics and throw with no arm pain at all and I truly felt a difference in velocity, ball movement and control. I told him "you're a genius, you have figured out the best way to teach pitching". After working with Mike and knowing I could throw with no arm pain it really made me believe that I would be able to pitch competitively again this season after not being able to for a over a year, I truly owe Mike so much. If anyone that wants to add velocity or gets a sore arm or worse needs Tommy John surgery has any doubt about working with Mike and learning his philosophy of pitching please contact me and I will personally tell you if you buy into everything he says and truly work at it you will not be disappointed. This is in appreciation of what Mike Sedberry has done for our son Michael. He started rehabbing 8 months after having Tommy John surgery and with some setbacks he was still having some pain in his elbow. After hearing the same crap from so many pitching coaches I reached out to my old buddy Mike Sedberry to get his thoughts. After sending Mike some pitching videos and numerous phone conversations of Mike explaining what our son was doing wrong he agreed to come out to Texas for a 3 day crash course and try to help Michael get on track. The difference we saw in Michael's pitching those 3 days was mind boggling. Fast forward 415 days from his arm injury to Michael's first college game back and it was story book, he struck out the five hitters he faced. First and foremost he is pitching pain free (we would have been very happy with just that) and his control now is off the charts in 13 2/3 innings he has 0 walks. His ball now has more movement, he's throwing a heavy ball, his velocity is higher from 87 mph to 89 mph and he's not really back to full strength yet. The changes you have made in our daughters pitching is amazing. We thought she threw hard and her instructor said she could maybe see an increase in speed of 2 to 3 mph per year. The first lesson you showed us everything we were learning (faster arm circle and snapping the wrist) was making her throw slower. You gave us one drill and when we came in she had gained 4 mph on her fastball. That blew our minds. In 5 months she has gained 10 mph on her fastball, her control is amazing. Other parents can't believe how much better she is, it was suppose to take a minimum of 3 years to gain 10 mph. We owe this all to you. Jennifer D.
You have changed my sons career. He was doing everything you said is wrong (balancing and throwing over the top). You showed us a completely different way and I am so grateful. Because of you he has added speed, his pitches have movement and his arm doesn't hurt anymore. He tried out for an elite travel team and after 1 pitch the coach tried to get him to balance and go over the top. I told him to let my son throw a few more pitches. After 20 more pitches the coach told me he had good speed and really good movement on the ball. He said you can't teach movement and I smiled and thought Mike Sedberry does. Thanks, Scott N.
I can't believe the difference you made in Jacobs pitching. When you showed him how to throw with the body his speed increased in the first lesson. The next practice the coach couldn't believe the difference and said his arm was getting stronger. I told him we were learning to take his arm out of the pitch which is why he was throwing harder. He thought I was crazy. The next game he pitched two innings and had four strikeouts. His arm doesn't hurt anymore. Many of the parents around us couldn't understand why it looked like his arm was going slower but the ball was going faster. We love it. Greg F.
I just watched a pitching lesson I still can't believe. My son has been pitching and getting lessons for 4 years. He's got up to 52 mph but when he does his control suffers and his arm will get sore. Our first lesson you videoed his pitching and showed us most everything we were learning was the cause of our problems. You showed him a couple things and gave us a drill we worked on every day. The second lesson you added another step and he hit 54 mph. The third lesson you showed him how to release the ball and 30 minutes later he threw 60 mph. This was amazing and I still can't believe it happened so soon. Everyone needs to learn the way you teach pitching because you throw harder with better control and no sore arm. Matt W.
My son's pitching was bad. His middle school pitching coach wanted him to balance, throw over the top and snap his arm down at release. Your site said this is wrong. His arm had been hurting. You video taped him pitching the first lesson and told us he was losing speed, control and he would have arm problems if he continued to pitch this way. The fastest he had been clocked before was 46 mph. In just 5 lessons he is up to 54 mph. His arm doesn't hurt anymore and the last game he had 10 strikeouts in 5 innings. You are a miracle worker the way you teach pitching. I never would believe he could throw this hard, have this much success and have no arm problems, before you. Thanks for everything. Roger G.
Almost everyday baseball and fastpitch softball pitchers and fielders come in looking to throw harder with better control. Most say when they try to throw hard their arm gets sore and their control suffers. Recently our local news station WSAZ TV said there was a survey that said 75% of baseball and softball players have sore arms. Sadly this is only because of bad instruction. Some players have to go through physical therapy and some even need surgery. These arm problems DO NOT need to happen with proper instruction. The problem is the wrong pitching mechanics are being taught by 99% of pitching coaches and instructors, former High School, College and pro players, at High School, College, pro pitching camps, by other parents, in instructional books and videos. They think velocity comes from arm strength and arm speed. Almost every pitching cue, warm up program and drill that pitchers and fielders are taught causes BAD throwing mechanics. Sadly, these pitching cues and drills lead to a decrease in speed, control and an increase in arm soreness and injury. In BASEBALL these are the worst pitching and throwing cues being taught to almost every player. If you are learning any of these you will not throw as hard as you should, your control will suffer and you will put much more stress on your shoulder and elbow. The last few years we are seeing many more arm injuries and Tommy John surgeries, as young as 11 years old, mainly because most baseball pitchers and fielders are being taught these worst throwing cues . In FASTPITCH SOFTBALL these are the worst pitching cues that are being taught to 99% of pitchers. Almost every new pitcher that comes in (99%) is doing most of the above bad pitching cues. They reduce a pitchers speed an average of five or more miles per hour, hurts their control and also puts much more added stress on the arm and shoulder. Most new pitchers add 1 to 2 miles per hour in the first lesson because the difference is amazing when you learn what the best pitchers really do. If you want to become the very best pitcher you can be, you want to learn the exact mechanics of the best pitchers in baseball and fastpitch softball. You will be surprised how, with good pitching cues, you can throw harder, have more movement on your pitches and have better control. This helps pitchers to become much more successful and help prevent arm soreness they can get from using bad mechanics, that can lead to serious and sometimes career ending injuries. Learn the seven traits all successful pitchers have in common that help them throw harder with more control. Even in pro baseball and fastpitch softball, pitchers perform these traits at various levels, the most successful pitchers execute them at the highest level. We also use a radar gun so you can see the increase in your velocity as you learn these traits. You will learn about pitch movement, changing speeds and game management. Become a more successful and confident pitcher. We also offer throwing lessons for all players that want to learn how to correctly throw the ball harder with more accuracy and no stress on their arm. All new students are video taped so they can see what their pitching or throwing motion looks like now compared to the very best in baseball and fastpitch softball. You will see frame by frame how the best add more speed, control and look so effortless. I will show you what we will be working on in the lesson so you can use your body like the very best. Most students and parents are able to see a tremendous difference even in the first lesson. If you want to work on pitching or throwing and hitting the first time we suggest a 1 1/2 hour video lesson where we will do the same as above for both. Afterward you can do a 1 hour lesson to work on both. The video is very important because everyone will see you are learning the exact mechanics of the best pitchers in baseball and fastpitch softball. We have students and parents that drive 3 hours or more from all over West Virginia, Ohio , Kentucky and Virginia for lessons. Most come in and take lessons over a two day period. We have special rates for our lessons and a local hotel. They come to us because they are learning the same bad pitching and hitting cues in their area and their kids aren't reaching their full potential. They are excited to see their kids swing or pitch compared to a Major League or Team USA player. They are amazed that it is so different from what they have been learning. When they see how much better they get in just two days of lessons they are blown away. Now they are on their way to reaching their full potential. Call 304-722-6393 for more information. Call 304-722-6393 for more information or to schedule your lesson. We have special pricing for teams and groups of 2 or more students.